It's always a good idea to have slugs you can switch to for more precise shots when using your shotgun in the hunting or self-defense role. 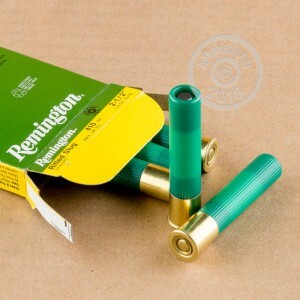 These .410 Bore shells from Remington feature moisture-resistant plastic hulls with a total length 2-1/2 inches, a short standard that will fit the smallest chambers, even those on youth shotgun. The hull is contained within a sturdy brass head which provides positive extraction out of pump-action shotguns and break-open actions. Each head is fitted with a clean-igniting 209 size primer. Within the shell sits a bare lead slug with a rounded body, flat nose, and rifled skirt which interfaces with smoothbore barrels to provide excellent spin stability for accurate shots at a distance. 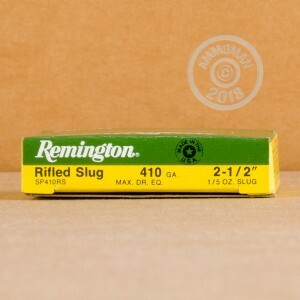 The slug weighs in at a fifth of an ounce and is designed to make blunt entry into a game target or threat with a mild degree of subsequent expansion which helps transfer energy to the target for more positive damage. 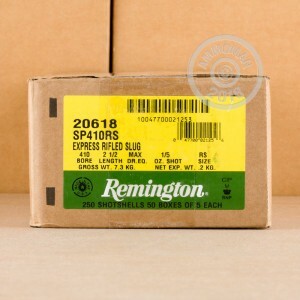 Remington has over 200 years of experience under their belt is one of the most recognized manufacturers of ammo and firearms in the world.